What’s Next For The Gold Bull? Arguing for the bearish case, is Robert Prechter of Elliott Wave International. He writes that since 1913, as shown in the chart below, the purchasing power of the US dollar has eroded by 96% (great job Fed!). 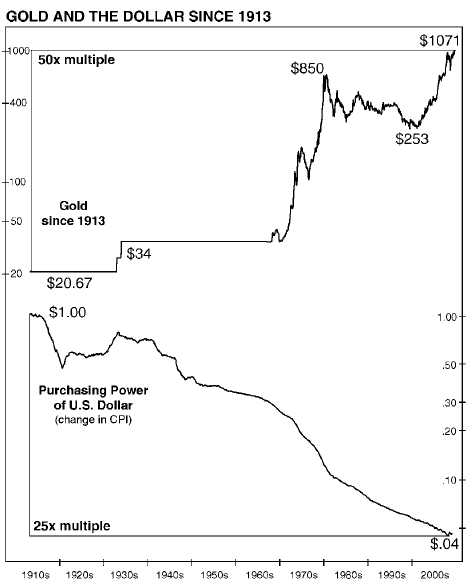 If gold had simply offset this loss in purchasing power, it would have to have increased 25 times. But instead gold has multiplied in value by 50 times. Therefore, Prechter argues, it is 50% ‘overvalued’. This is a strange sort of argument because most gold bugs would say that gold’s strength, the very fact that it has gone up so much, reflects positively on the precious metal. Prechter has had a very hot hand lately in timing the stock market so I’m willing to listen to his argument even if it sounds a bit odd. It appears that he implies that gold’s only sensible ‘value’ is to be the anti-dollar. However, I’m not sure that’s a valid point because as far as I’m concerned, gold is just another commodity with all the inherent susceptibilities to manias and panics we ascribe to other more traditional markets like stocks. A gold buyer today must be really convinced that inflation is going to take off in order to justify buying at today’s prices. Of course, buyers today are convinced that inflation will rage, just as they were convinced that inflation was no threat at all back when gold was at $253. According to Oppenheimer & Co.’s chief investment strategist, Brian Belski, gold and the US dollar have had a -0.2 correlation in the past 40 years. Had gold been the anti-dollar, then the correlation would have to be much closer to -1. Their correlation is low because it isn’t unheard of for gold to rise even when the US dollar is rising. In fact, gold tends to rise much more than average when the dollar is strong. Belski is bearish on gold believing that there is no valid fundamental argument for it at this price point. Since gold’s seasonality turned positive in September, gold futures have returned +8% (with a high of 12% earlier this month) and the Philadelphia Gold Bugs (HUI) index has returned 9.5%, after hitting a maximum of 29.5% in mid October. This is a good start for what should be gold’s strongest period in the calendar. And it isn’t over yet. The historical pattern of seasonality continues strong until around February and March of next year. Several measures of gold sentiment are suggesting headwinds. The latest Commodity Futures Trading Commission numbers show the speculators piling on to historic levels. As well, Market Vane’s Bullish Consensus for gold is hovering just under 90% where it has coincided with the end of rallies in the past. The Hulbert Gold Sentiment Index stands at 53.8% which is relatively modest, taking into account the price action. However, what is disturbing about this sentiment measure is not its nominal level but that while gold and gold stocks have tumbled in recent days, it has continued to reflect the same level of bullishness. 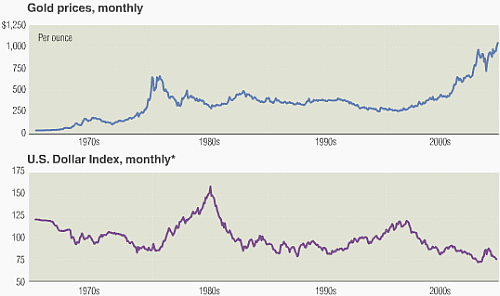 Finally, it bears repeating that gold and gold stocks tend to actually follow the general stock market. This may sound counter intuitive to those who haven’t actually gone back and looked at the historical data. The best antidote to the tenacious myth that lingers about gold as a ’safe haven’ is hard data. Today this means that with a return of risk and a softening of the equity markets, gold and gold stocks will follow suit. No, there is no free lunch. But for my US readers, there is a free trading magazine subscription in their future.. For a limited time, you can get a complimentary subscription to SFO magazine (Stocks, Futures, and Options). It takes less than a minute to sign up and you need to provide some basic information. But as I mentioned, you need to be a resident of the US (because you need to provide a US address). Enjoy!